UDM Downloads > MagicScore Maestro! 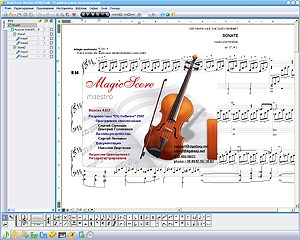 MagicScore Maestro - professional music notation software, offering the most advanced capabilities for working with music. It lets you precisely tune up the notes' sounds and their timing features, process the effects and the dynamics. In this program, you may use both general and extended sets of musical symbols and as well create your own symbols, terms and chords for complex compositions with a peculiar or a non-standard grammatical solution.